Grading & Drainage is always a significant consideration before and during any landscape project. 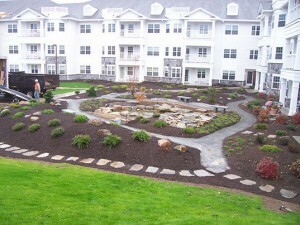 Landscaping does not need to be derailed by drainage issues. Consider a drainage system. Excessive amounts of water and precipitation can be very harmful to lawns and gardens. Soggy properties can make it difficult for lawns and gardens to thrive. In some instances, whether it’s a byproduct of poor property grade or sloping land, water can create pooling. To determine where the problem is and how to best resolve to the problem: speak with a landscaper. Solutions to particular drainage problems can vary. Plants that thrive in moist conditions can protect against soil erosion and may absorb enough water to guard against pooling. In addition, amending the soil with organic matter, pea gravel or another coarse aggregate can also assist to prevent water pooling. Want to know more about expert landscaping and garden care? Contact us today. 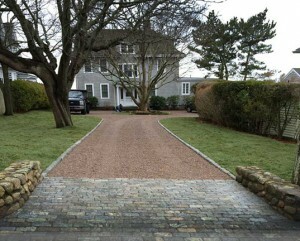 New driveway installations or grading and topdressing of existing surfaces. 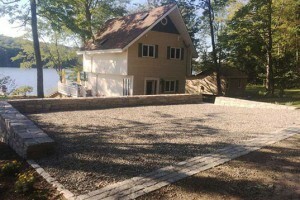 A gravel driveway can give a home an updated look and improve the curb appeal of their home. Gravel is an affordable material that requires little maintenance. Puddles that form during a rainstorm may not be indicative of anything other than a rainy day. But the water that pools or runs down the middle of the driveway may indicate drainage problems. Such problems may be the result of structural problems with the slope of the driveway, which can cause bigger issues down the road. Edging the driveway with a material like timber or bluestone can prevent the gravel from washing away should heavy rains fall. Driveways endure quite a bit of wear and tear over their lifespans, and homeowners who have not given their driveways much thought may want to start looking for potential trouble signs that indicate a need for some driveway maintenance.